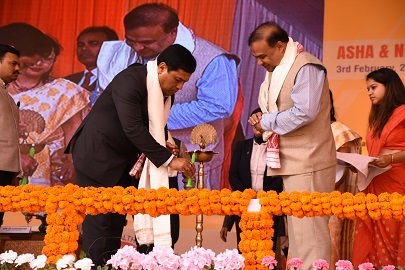 Assam Chief Minister Sarbananda Sonowal urged the ASHA and employees of National Health Mission (NHM) to take forward the message of government health schemes more forcefully to the grassroots for heralding a positive change in the lives of the people of the State. 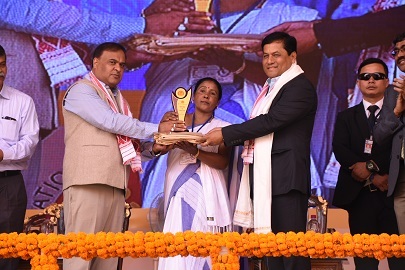 Chief Minister Sonowal made this call while taking part at the 2nd ASHA and NHM Convention, 2019 organized by the Department of Health, Government of Assam at Sarusajai Stadium in Guwahati on Sunday. The ASHA and NHM convention organized after a gap of ten years was an endeavour to recognize and appreciate the valuable contributions made by field level functionaries of NHM in improving health care delivery system in the State. Presently, 31,955 ASHA workers and 20,921employees are working in various categories under NHM in Assam. Lauding the committed services rendered by the ASHA and NHM employees, Chief Minister Sonowal said that the State Government has taken up health as a priority sector to keep people of the state healthy to chart a new course of development in Assam. “During last two years and eight months, our government has launched initiatives which have never been taken in the last sixty years of India’s independence. Our aim is to bring revolutionary change in this sector to make health care facilities more affordable and accessible” he said. He also informed that under Chief Minister Free Diagnostic Scheme, around 20 lakh patients have been benefitted in the state. Further urging the ASHA workers to work as a bridge between the Government and people, the Chief Minister called upon them to generate more awareness among people about healthy life style and promoting cleanliness in society. Minister for health and family welfare Dr Himanta Biswa Sarma while speaking on the occasion said that many interventions have been brought in systematically to address the issues faced by ASHA and NHM employees during the tenure of present Government. He informed that as a result of committed efforts of the Government, MMR in the State has presently come down to 237 from 480 since the time of launch of NHM in 2006. Similarly, there has been a reduction of IMR from 68 to 44 per 1000 birth, under 5 mortality from 78 to 52, he added.